What to do when unannounced guests drop by for dinner? No worries, mate, when your cabin is a Queenslander. Simply toss more shrimp on the Barbie and kick back on the veranda. But you don’t have to live Down Under to roost in a tropical beach house. This beauty happens to be on the southeast shore of Lake Michigan. And you don’t have to be an Aussie, either – although it helps. Just ask Bill Gunnar. Gunnar’s ancestors lived in Australia in the late 1800s. In fact, his great-grandfather and namesake, Sir William McMillan, was a member of parliament in 1901 when Australia became a unified commonwealth. During that time, a new housing style was taking hold in the state of Queensland on Australia’s northeast coast. Built on stilts or tall stumps, the “Queenslander” offered respite from the heat, humidity and insects of the subtropics. High enough to walk under, the structure allowed for cooling breezes and easy termite inspection. A wraparound veranda encouraged outdoor living. Fast forward a century to Sawyer, Mich., where architect Howard Holtzman, AIA, is sketching designs on the beach. Gunnar has asked him to design a vacation home that will offer open, recreational living atop a 70-foot-high sand dune. Deposited by retreating glaciers that once covered Michigan, the big lake’s dunes are the largest assemblage of freshwater dunes in the world. They support a wide diversity of habitats, from forests of oak, hemlock and pine to open dunes to interdunal ponds. The dune on the property Gunnar had bought was stable and wooded. All parties involved wanted to leave the site as intact as possible. The challenge was to build a house with generous outdoor living areas without doing any grading or disturbing the trees. The solution: a long, narrow home that mimics the line of the sand dune, surrounded by a covered veranda. When the numerous French doors are thrown open, the indoor spills out onto the screened portions for total indoor-outdoor living. There are 2,000 square feet of “outdoor” living space, half of them enclosed. “In summer, the house works great for a number of people because it can expand,” says Gunnar. When Gunnar first contacted Holtzman about designing his beachside vacation home, the architect happened to be in Queensland designing an ocean-class yacht. “I liked the homes-on-posts,” Holtzman recalls, and those homes were his inspiration. Of course, the Queenslander style hit home with Gunnar. Found today all over Australia, the quintessential Queenslander is timber frame clad with wood. “It’s fairly lightweight with no wall cavity,” notes Holtzman. The Michigan house is more substantial because it needed insulation for its colder climate. The 2,600-square-foot cabin utilizes post and beam construction by Riverbend Timber Framing of Blissfield, Mich., and structural insulated panels from Insulspan, Riverbend’s sister company. Builder Gray Carlson of Carlson Construction in Michiana Shores, Ind., lent his expertise on preserving the natural contour and vegetation of the dunes in this resort area. “Because we didn’t want to disturb the trees, we had a very narrow spot to build on,” says Carlson. That also meant that there was no place to store building materials on site. So Carlson’s crew had to haul the materials away at night then haul it all back the next day. The off-site pre-assembly construction method was ideal for this lot that had a limited footprint and was hard to access. The long, narrow cabin is approximately 30 feet by 100 feet, and its length is oriented along a north-south axis. The front elevation faces west toward Lake Michigan. To the east lies a wooded ravine. 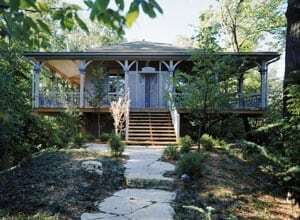 Gunnar departed from the traditional Queenslander metal roof in favor of cedar shakes. But the front door boasts a fan-shaped design – a common Queenslander touch. Inside, steel joiners feature whimsical cut-out stars to make these structural components decorative. All interior posts and trusses are oak. A central great room comprises one-third of the main floor. 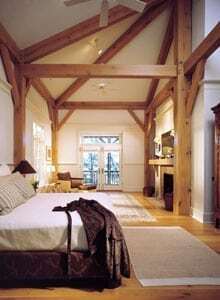 At one end is a master bedroom suite with storage loft and bath. On the opposite end of the great room are two bedrooms and a three-bunk sleeping loft. A bumped out galley kitchen has two side doors that open onto the veranda. The kitchen’s raised bar accommodates casual eating while screening cooking clutter from the great room. And in the winter, two fireplaces – one in the master bedroom and one in the great room with a Wisconsin limestone surround – keep the cabin toasty. The Queenslander’s elevation above ground makes installation and maintenance of electrical and plumbing systems a breeze. It also provides space to store boats and vehicles. 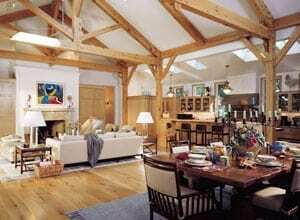 Interested in seeing more pictures of this beautiful timber frame home? Visit the gallery, Lake Michigan Residence.